For lead generation, 87% of B2B marketers’ use email marketing to generate new leads, while 31% of B2B marketers’ cite email marketing as the channel that makes the biggest impact on revenue. In terms of return on investment, the Direct Marketing Association (DMA) found that email marketing delivers a $40 return for every $1 spent. 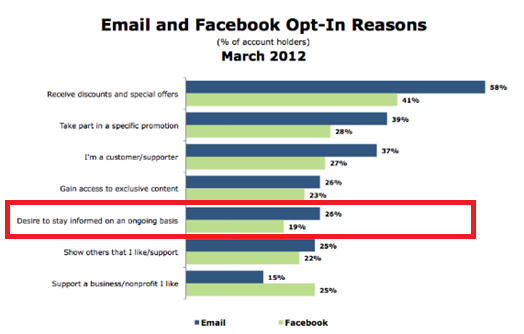 It’s numbers like these that makes email marketing so valuable. But, how are you using email marketing for your business? 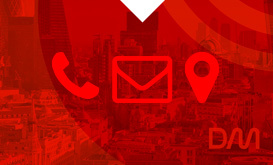 And what email initiatives will you focus on in 2016? A study by Strongview found that, for most businesses this year the top priority for email marketing is clear: Increase subscriber engagement. Increased subscriber engagement means more sales, higher revenue per customer and overall, better profits. But how do you increase subscriber engagement? You can do this by sending different types of email campaigns. Subscriber engagement is unlikely to grow if you send the same type of emails over and over again. Think back over the last 12 months and the number of times you have sent the same kind of email to your list. Did it increase engagement? Not likely. So what kind of emails can you send your email subscribers? To answer this question, we’ve created a quick guide that includes 17 B2B email marketing examples. We’ll start with examples from the top of the funnel and work our way down to help you increase engagement and deliver better results for your email marketing strategy. First impressions count. A lot. Therefore, if a subscriber signs up to something, whether it is to receive future blog posts or a series of email tips, it makes sense to thank them and welcome them. By doing nothing, you make it difficult to create a strong impression. 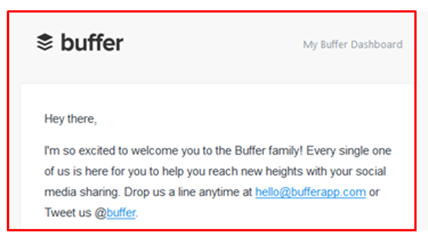 When you sign up to Buffer, the social media sharing app, their welcome email includes links to their support email address and a link to their Twitter profile. Simple yet effective! 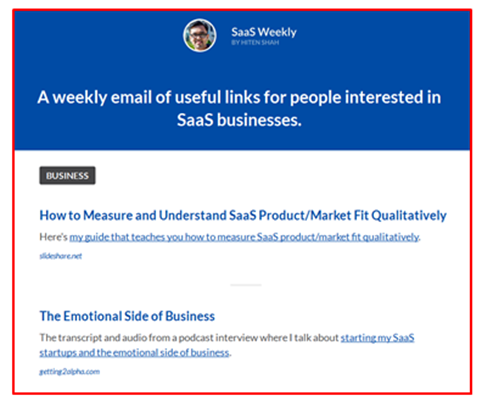 Each week, CrazyEgg and Kissmetrics founder, Hiten Shah sends a roundup of his favorite posts on topics that include SaaS, marketing, sales and growth. Hiten is able to deliver great content directly to his readers without them having to search the content out online He’s helping his readers do better, which adds a lot of value to his subscribers. How to implement: Whether you’re in customer service, social media, banking or the automotive industry, create a list of the best content you’ve read and share it through email to your subscribers with links to this content. In doing so, you’re delivering value without being self-promotional. 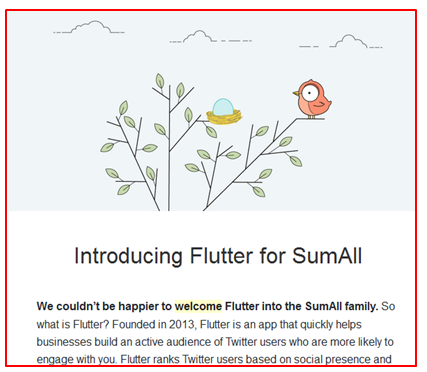 When SumAll acquired Flutter, a tool that helps businesses grow their Twitter following, one of the first things they did was inform their subscriber list. In doing so, they were able to create new interest in their product offering. So for prospects that were not sure whether SumAll was the right fit for their business, announcing this kind of news is likely to have a more positive impact. How to implement: Whenever you have news to share, such as winning an award, changes to product offering or new pricing options, for example, announce this news to your subscriber list. You can either include all of the company news within the email or itself, or link the email to a landing page. When to send: Each time you have news to share. 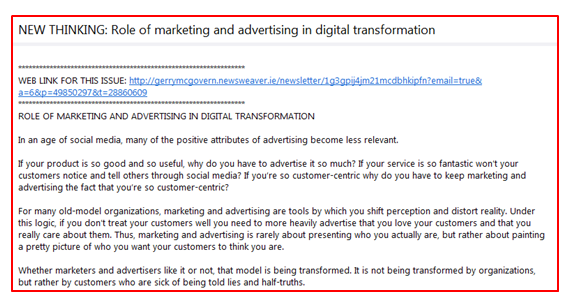 Gerry McGovern has long been sending new article content published in his weekly “New Thinking” email series. The email content, which is a copy of the article content that is published on his website, is a great way to update his email subscriber list of new content, without the subscriber having to visit Gerry’s website. 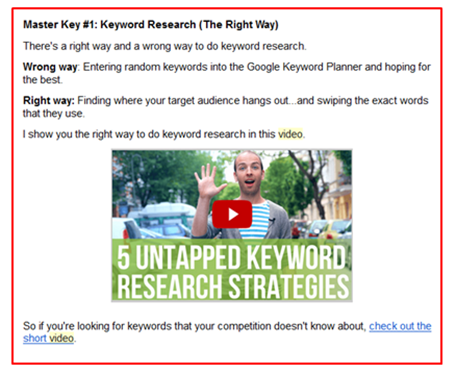 How to implement: Whether you use this example for new blog post content or article content, you can copy and paste the content directly into the email, like Gerry does, or provide a link to the webpage and drive readers to your website. When Brian Dean, founder of Backlinko, sends an email, the chances that it contains a video are pretty high. 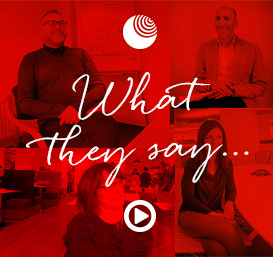 By providing actionable content through video, Brian is able to not only deliver value, but build a rapport with his subscribers as they get to see and hear Brian on a regular basis, which builds an even deeper connection with his audience than he would create compared to reading web copy, as the person watching the video feels like theyreally know Brian. How to implement: Take one of your best performing pieces of content and create a video version, and provide the tips in the content in your video. It doesn’t have to require a film crew or include special effects, all you need is to be visible and on screen. According to Epsilon, approximately 40% of your email list in inactive! This means that each time you send out an email, almost half are no longer interested in hearing from your company. 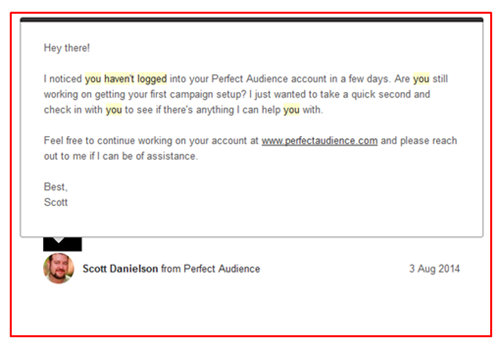 In the example above, Perfect Audience has sent out an email to a new user who has become inactive. This email is a great way of restarting the conversation and reminding the user that they can use the product, or get answers to any questions they may have. Accurate data is important to marketers’, especially when it comes to running tests on their website. 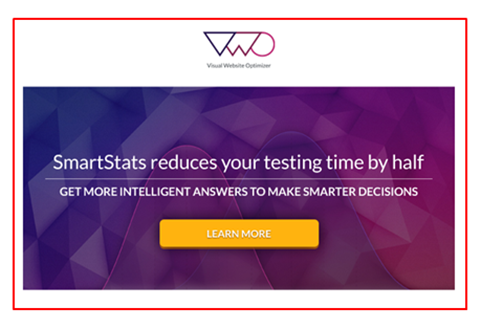 When VWO launched SmartStats, they informed their audience of the new change and how it impacts users – and how it can help them with their tests. For prospects on the fence as to which vendor to choose, this is the kind of change that can lead to an increase in new customers. How to implement: Your company’s product will evolve, and each time you add a new feature of improve an existing feature, it could be the improvement that turns many prospects into a customer. However, you need to get the word out and inform them so they are aware of these changes. The next time you update your product, send an email to your subscribers with a list of changes/ updates. Remember to use simple language so instead of including “Feature enhancement 4.2”, you explain how this change impacts the user, i.e. Users can create quotes and send via email in one click”. How to implement: Next time you launch a new piece of gated content, announce the launch to your subscriber list. Just like in the example above, keep the email short, benefit driven and include a call to action, which asks the reader to download the guide from a dedicated landing page. The goal of the email is to drive readers to your website. As far as customer acquisition channels go, webinars are one of the most effective ways of speaking directly to your potential customers. 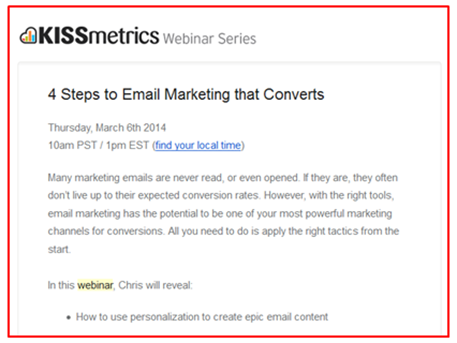 Kissmetrics uses email marketing as one of the ways to promote a webinar, which makes it easy for subscribers’ to learn about upcoming events and schedule the time to attend. Webinars are a great way to showcase your expertise and engage with buyers’ who are further down the sales cycle and looking to make a purchase. How to implement: Instead of creating a brand new topic to host a webinar on, use existing content and repurpose it into a webinar topic. For example, take a piece of content that performed well, and on a topic you are comfortable talking about, and then send an email to your subscriber list with an invite to a webinar. Make the date and time of the webinar clear, and include a description of what the webinar topic is about. 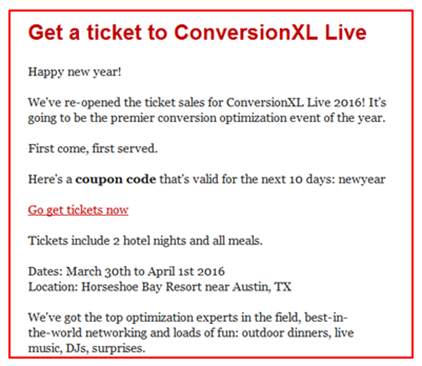 When Peep Laja launched his ConversionXL conference this year, it wasn’t too long until he let his email subscribers know about it. Do you know why? It’s because his subscribers are potential event attendees (and therefore customers)! In fact, during a recent AMA (ask me anything) on Inbound.org, Peep went as far as saying 80% of his conference ticket sales come from his email list! There’s no better way to promote an event that to invite people that already know who your company is and what you do. A 2015 study by BrightCove and Content Marketing Institutefound that meeting potential customers is the most effective tactics for B2B marketers’. So next time you host an event, invite your email list! 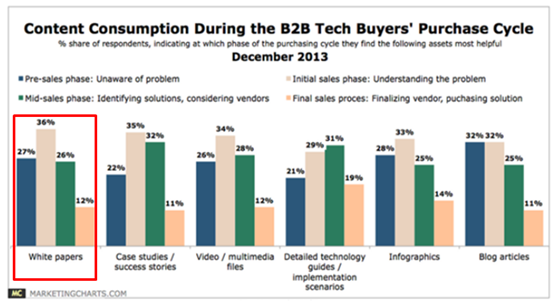 As B2B buyer’s move further down the funnel, the value of a case study grows. A case study is a great way to show how your product can help a business improve, whether that’s in terms of sales, productivity or communicating with customers. 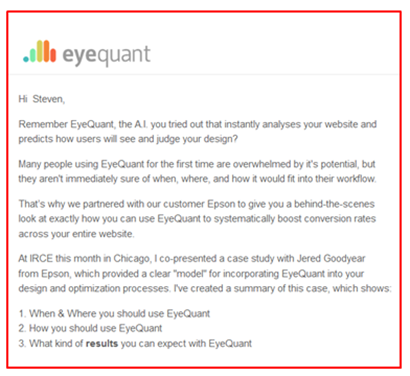 Eyequant’s case study email starts by explaining the challenges similar companies face. This is followed by the details of the case study, which includes how to use the product and what kind of results you can expect. The results are the most important part of a case study. Showcasing product value for companies similar to your prospects is a great way to earn trust and turn them into customers. How to implement: You can take an existing case study and send an email to prospects with a link to the study, or you may have to ask your customers if they would like to be featured as a case study. The latter might take more time, but once you have a case study or two, you can use these for several months or years to come. Remember to focus on the results part as this is where the real value lies! When to send: Bi-monthly or quarterly. This is for later stage buyers. In terms of lead quality, Software Advice found that 80% of marketers’ rate “live demo’s with sales reps” as the most effective way to generate high quality leads. 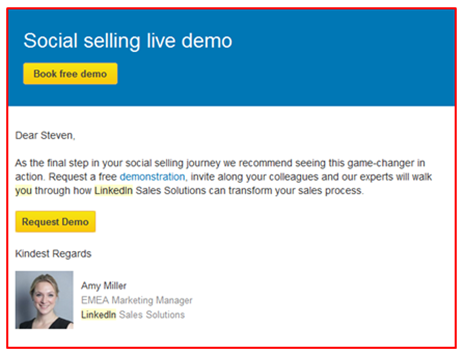 Therefore, it makes sense to invite potential customers to a personalized demo with a sales rep. As part of their social selling campaign, LinkedIn not only sends a personalized email invite addressed to me by name, but they also signed off with an image from one of their sales reps. Adding a photo is a quick and easy way to build trust. The email is short, clear and personal – and therefore, very effective! 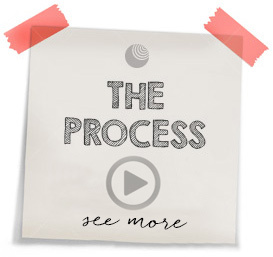 How to implement: Create a list of prospects that have completed at least one key action on the website (for example, downloaded a piece of content) but have yet to be entered into the sales process. Create a personalized email, and invite them to a live demo. The live demo can be hosted through screen sharing on Skype or through a video chat. When to send: Can be done on a per lead basis, or on a monthly basis. 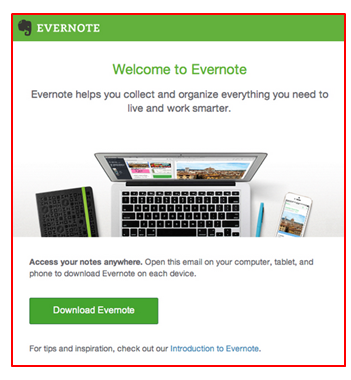 When you sign up to Evernote, the first thing they do is send you an email to download the product. This email works because it continues the conversation that started when a user visited the website and signed up, to now asking them to download that product. Is the email effective? Definitely! As according to Evernote, they have more than 150 million users as of July 2015. How to implement: If someone signs up to your product, send an email to continue the conversation. Whether the new user has to install, download or login, make the focus of the email clear, and use only one to call to action (like Evernote does). If you download a piece of content, or complete an action on a website, a thank you email is a great way to connect with your audience. 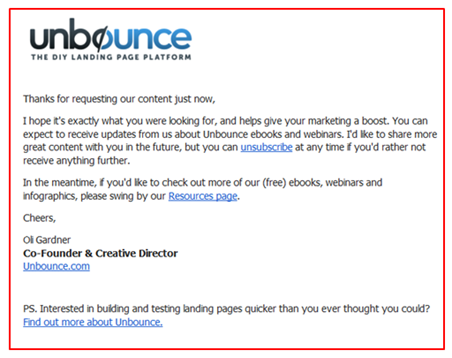 At Unbounce, they send you a thank you email when you download a piece of content – in this case, a white paper. 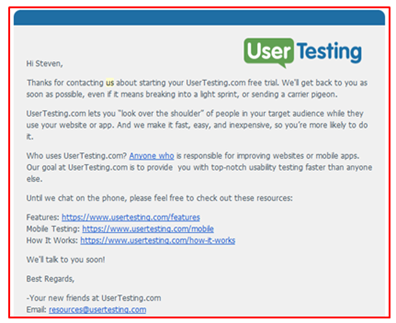 What works well for Unbounce is the email is sent in plain text, rather than a HTML designed email template. It looks authentic and feels genuine, which makes the reader feel valued. 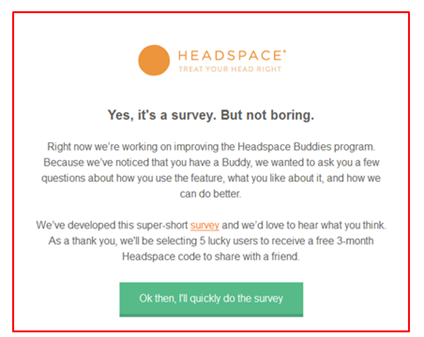 Although technically not a B2B email marketing email, it would be a crime not too include this Headspace survey email. Headspace, the meditation app that has more than one million downloads, comforts the reader immediately with this survey email by opening up with “Yes, it’s a survey. But not boring”. Most people assume surveys are boring. This statement makes it clear it won’t be, or at least attempts to do so. To increase response rates, Headspace offers an incentive where participants can win a free 3 month subscription. And the focus of the email is clear. White back ground, green call to action button. How to implement: Setting up the survey is the difficult part. You can use Google surveys, which is free or a paid tool, like Survey Monkey. Keep the survey short, as no one likes to spend more than 5-10 minutes on a survey, to increase response rates. As for the email itself, the focus is on getting people to participate, so make it clear what you want the reader to do. When to send: Quarterly or two times per year. The feedback you collect is pure gold! How to implement: Each time someone signs up for receive a free trial of your service, thank them for signing up and provide supporting information and helpful links to keep them engaged until the free trial service begins. When to send: Each time someone signs up for a free trial. We started this B2B email marketing examples list with Buffer, and as they are the masters of email marketing, we’ll end with Buffer as well. What normally happens after a free trial is the communication takes one of two paths; the first path is that the free trial user becomes a paying customer – Whoohoo! The second path is that the free trial user doesn’t become a customer, and therefore the communication comes to an end. 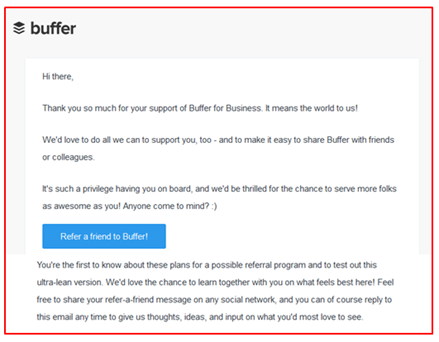 However, what Buffer does really well is follow up with the user and asks for a referral. The referral email keeps the conversation going, even asking for input on suggestions or ideas to their product. How to implement: Create an automated email that is sent between 3-4 days after the free trial has ended to all trial users who do not become paying customers and ask for a referral. In fact, the content of the email can be the same whether the user becomes a customer or not. Keep the email simple, focus on getting a referral and if possible, keep the conversation going. When to send: Send this email 3-4 days after the free trial has ended. The role of email as a measurable, cost-effective marketing channel is clear. Backed up by both professional opinion and industry statistics, email has an important value for businesses in creating sales leads and revenue, and retaining customers. The next time you create an email campaign, use one of these 17 B2B email marketing examples to help you deliver engaging content to your subscribers. 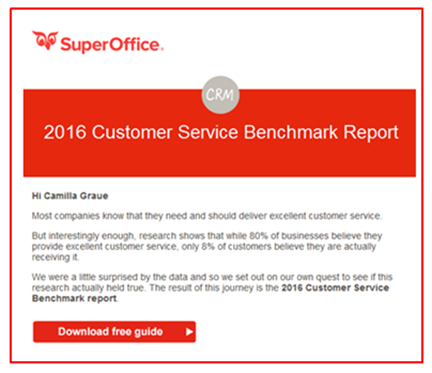 What do you think of these 17 B2B email marketing examples? Are there any B2B email marketing examples that we haven’t included? P.S. If you found this post valuable, please tweet about 17 B2B Email Marketing Examples. This post is long enough as it is, so thanks for making it this far. However, it doesn’t end here! In total, I’ve collected 30 B2B email marketing examples and have put them into an easy-to-download (or print) PDF document. The PDF is images only – easy to read and easy to take action. Would you like me to send you all 30 B2B email marketing examples? Brilliant Email Marketing Campaign Examples Where will marketing finds its maths men (and women)?